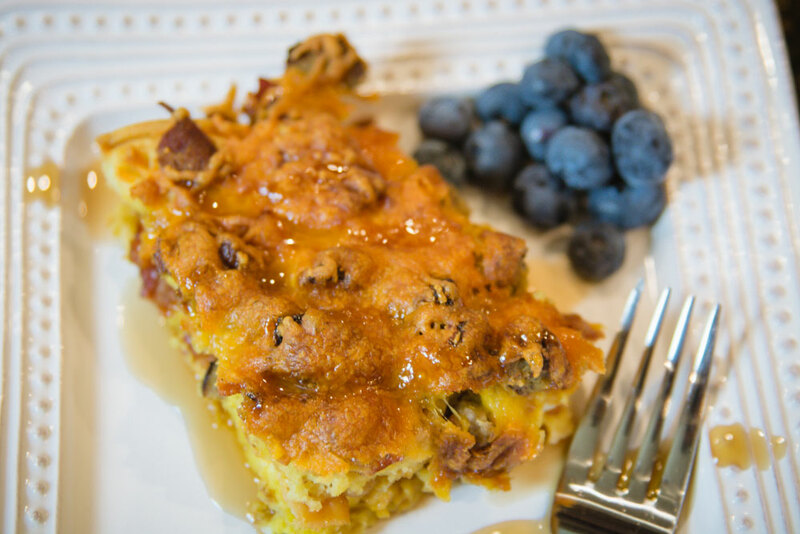 If you are the type of person who LOVES mixing all your breakfast items together, this recipe is for you! I recently wanted to make something for brunch that would please all our guests, but also easy enough that I could throw together the night before or at least a few hours ahead of time. This breakfast lasagna recipe was the winner! 1. Toast one box of waffles so they are light brown. 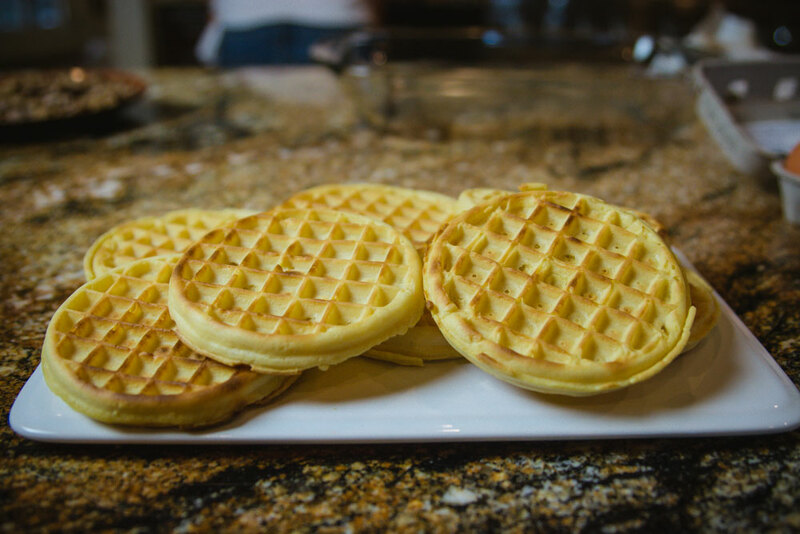 Yes, you could make your own waffles from scratch, but why would you do that when Eggo makes it so simple?! I really like to use the homestyle waffles. TIP: I have found that if you use a 9×12 pan, you will actually need a box plus two waffles (which is annoying) so use a smaller dish and one box is perfect. 3. 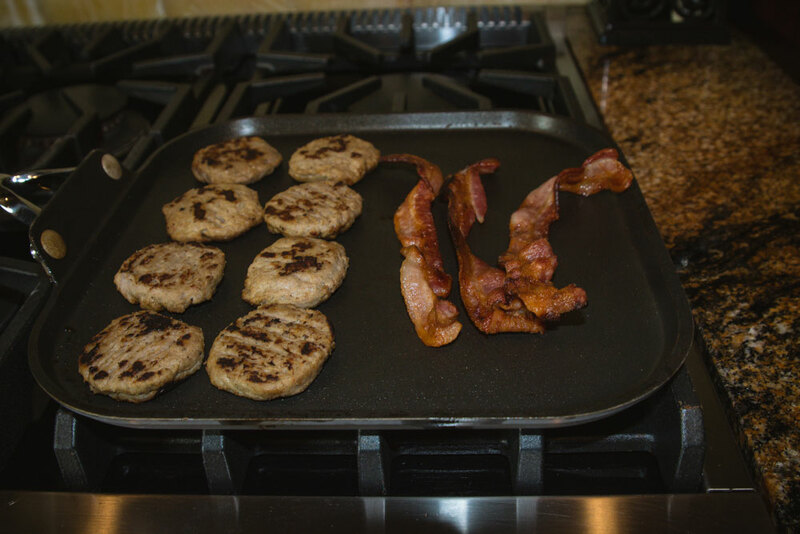 Make a pack of bacon and crumble both the sausage and the bacon. Set aside. Optional: you could do just sausage or bacon instead of both. 4. In a separate bowl, mix six eggs, 1/2 cup of milk, 1/4 cup of syrup (or a bit more if you like it sweeter) and salt and pepper to taste. 5. Now its time to start layering. Coat the pan with butter and add a layer of waffles – its ok to tear them up to fit. 6. 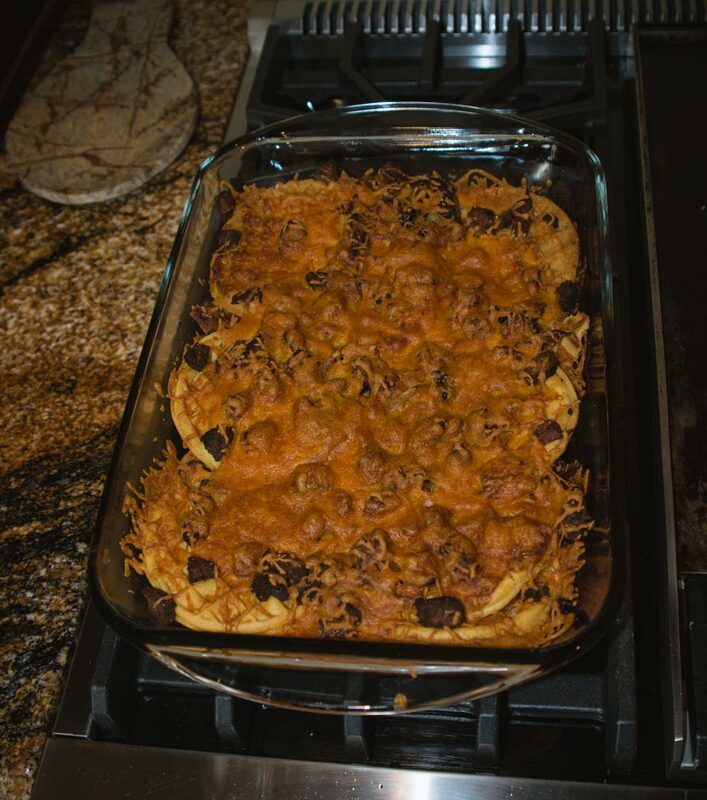 Sprinkle the sausage and bacon over the waffle layer, and top with cheddar cheese (as much or as little cheese as you want). 7. 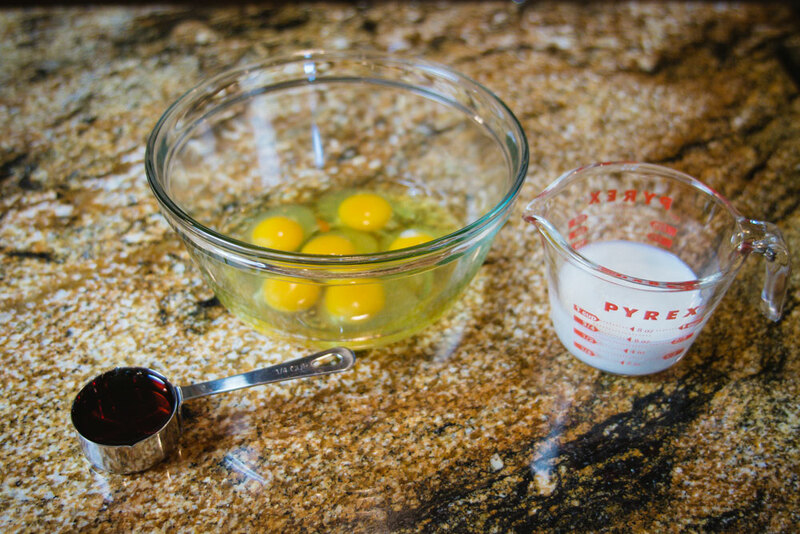 Add a little less than half the egg/milk/syrup mixture to this layer, and then repeat steps 5 and 6 to finish your final layer using the remaining ingredients. 8. I like to then let it sit in the fridge covered for a few hours and then pop it in the oven for 30 minutes (give or take) at 350F. 9. Simply cut and add an extra drizzle of syrup – YUMMY! 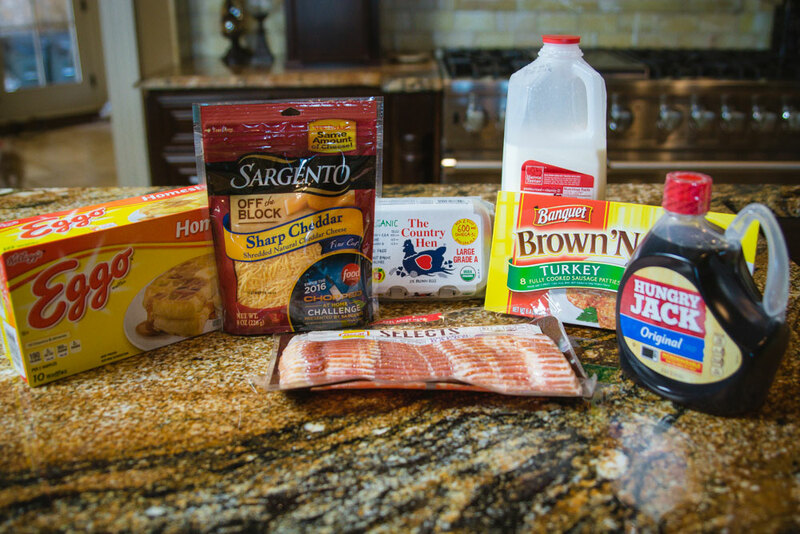 I hope you enjoy this easy breakfast lasagna recipe!